You have *got* to stop smashing all your alarm clocks with a hammer like you're in a cartoon. 1. 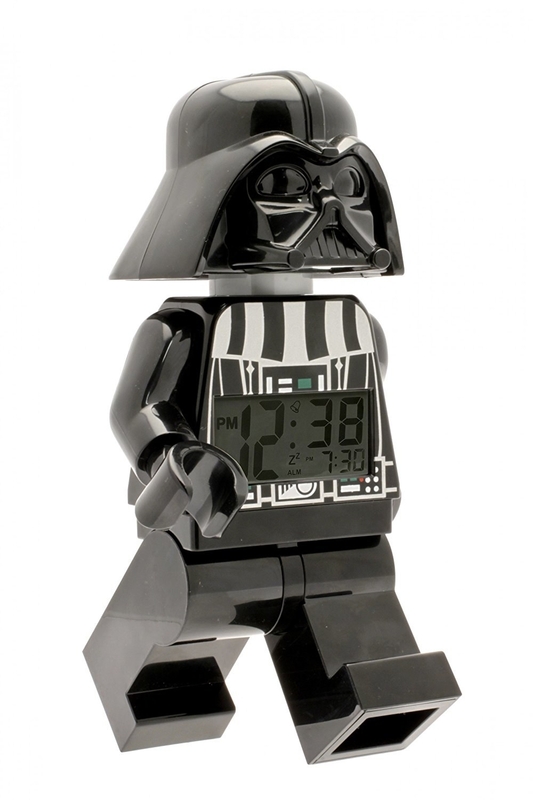 Join the dark side: get this Lego Darth Vader and never wake up on the wrong side of the bed again. Just like a real minifig, this one can stand, pose, and sit. 2. Feel sleek as hell with this elegant gold and matte black clock. Even if you don't use this clock for its alarm, its swanky design makes for great decor. Get it on CB2 for $29.95. 3. Wake up happy and hungry with a device that pumps out your favorite smell. This strange little alarm will wake you up with one of seven smells: seaside, espresso, croissant, chocolate, grass, toast, or peppermint. Each capsule costs $5.25 and lasts for 30 mornings. When you buy the alarm, you get a free toast capsule, so you can wake up each morning wondering if you're having the stroke. The panic will get you right out of bed—perfect! Get it on Sensorwake for $69.30. 4. Wake up to the sound of birds chirping using this darling little house. It's like having a birdhouse in your home, but without all the feathers and bird poop. Get it on Amazon for $21.92. 5. 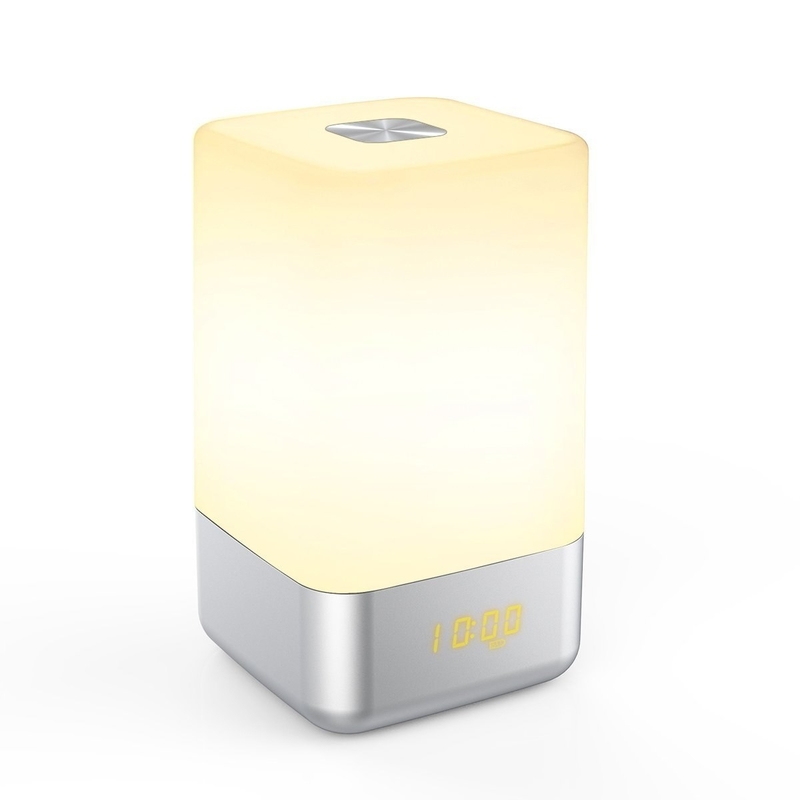 Get an alarm clock and light-show all in the one with this entrancing glowing rectangle. 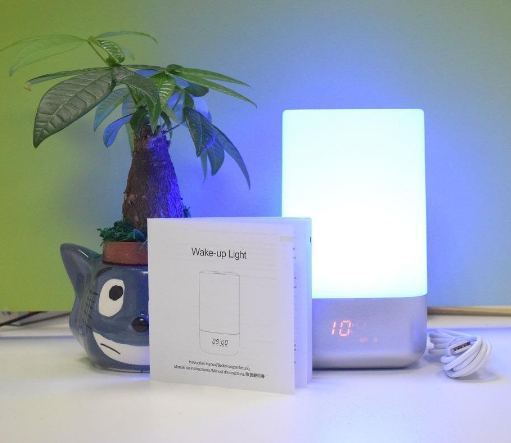 This LED light works as an alarm clock, night light, and charger. Similar to other models, it has a gentle wake-up technique that involves light and nature sounds that slowly increase in volume. Get it on Amazon for $30.99. 6. Start your mornings with a smile thanks to a car or cat-shaped cube. Made of silicone and plastic, both of these tiny digital clocks are great for your youngsters. Choose between a blue car or a pink cat to tell you the time and date. Get it on Pottery Barn Kids for $29. 7. Feel like you're going back in time with this no-nonsense alarm clock. Get it on Amazon for $13.99 (available in four colors). 8. Never oversleep again thanks to an insistent mat that won't shut up until you step on it. This mat does away with the snooze button and forces you to actually get out of bed on time. It's just the ticket for people who are always sleeping in. Get it on Amazon for $75. 9. Feel like a futuristic techie with a cool device that projects the time onto your wall. The projector swivels so you can point it in the ideal location. Get it on Amazon for $24.96. 10. Invite over this alarm clock that kind of looks like a grinning face if you're susceptible to pareidolia. This nifty little sphere is perfect for college kids and people with busy schedules. You can set multiple alarms or opt for the "nap function." It also charges phones and works as a multi-colored night light. 11. Travel with ease using a compact, battery-powered clock you can slip in your pocket. Afraid your next location won't have an alarm clock? Distrustful of your phone alarm? This little pal has got you covered. It's quiet too: Unlike other analog clocks, this one doesn't tick. Get it on Amazon for $10.39. 12. 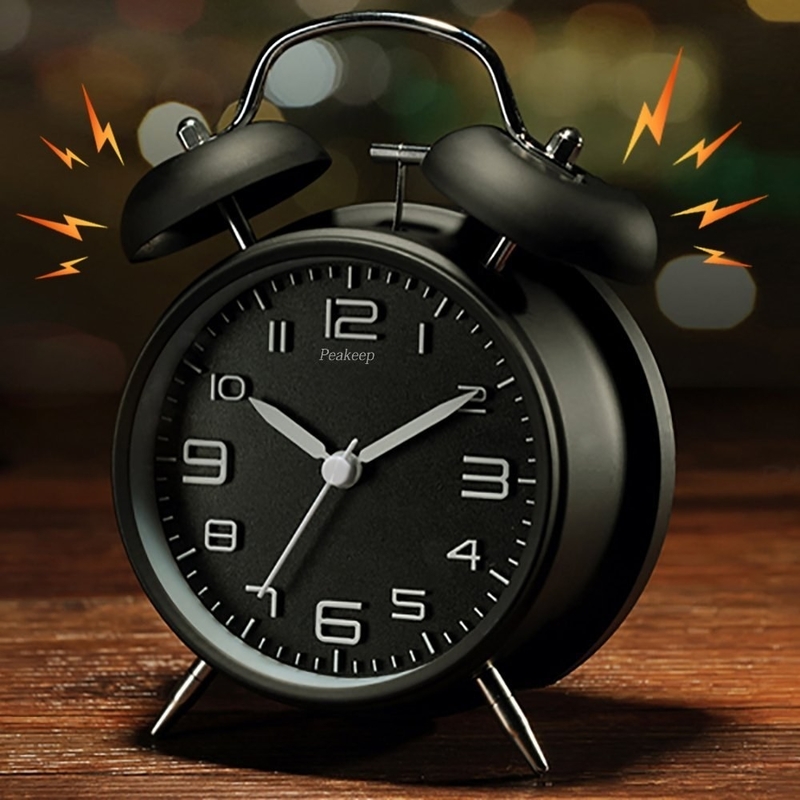 Scare yourself awake with an explosion-themed alarm clock that actually shakes your pillow. It's like one of the 4D shows every morning. Just slip the vibrating attachment under your pillow and you'll be shaken awake. Get it on Amazon for $30.71. 13. Wake up gradually using this patient machine that will slowly increase its alarm until you finally get up. Starting 30 minutes before the set wakeup time, the alarm clock starts quietly playing nature sounds, pumping out aromas, and lighting up. As it gets closer to wake-up time, the sounds, sights, smells get more intense until you're ready to wake up. Just imagine waking up to the sound of spring rain and the smell of lavender essence. That's how magical people wake up. That's how you could wake up. Get it on Hammacher Schlemmer for $79.95. 14. Feel like a rustic lumberjack with this wooden cube. 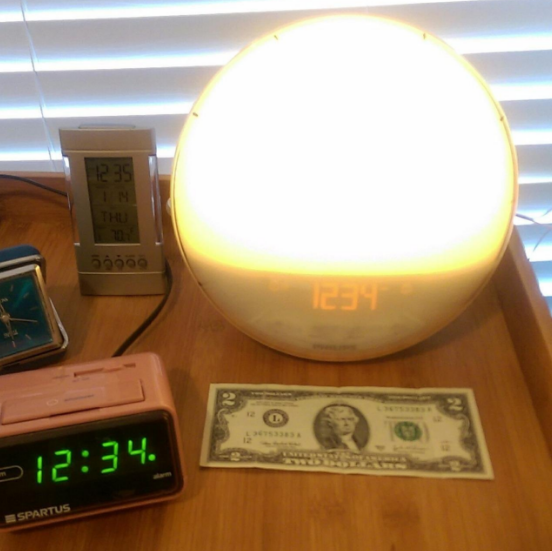 This digital desk clock uses soft LED lights to display the time. It comes with a dimmer and power saving mode for people looking to cut down on their power usage. 15. 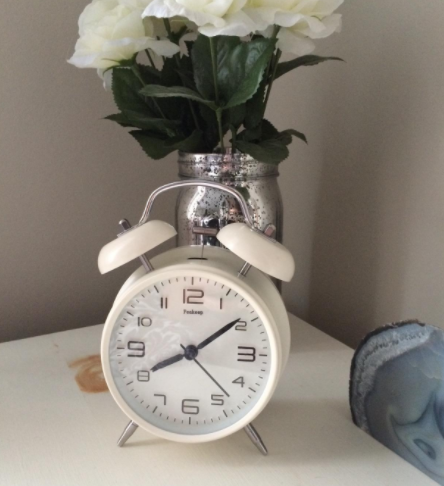 Keep it traditional thanks to this classic gray alarm clock with bells on top. Perfect for adding some quick charm to any room. Get it on Land of Nod for $35. 16. Feel like you're waking up with the sun no matter what time you're actually waking up thanks to this sunlight simulation clock. This clock creates the feeling that you're falling asleep by a sunset and waking up with a sunrise. It also has FM radio and a tap-to-snooze alarm clock. Thanks to 10 brightness settings, you can even read next to it. Get it on Amazon for $112.09. 17. Try not to swoon over this alarm clock with bunny ears (!!!) and chrome finish. You're going to want to hop right out of bed. Get it on PBteen for $59. 18. 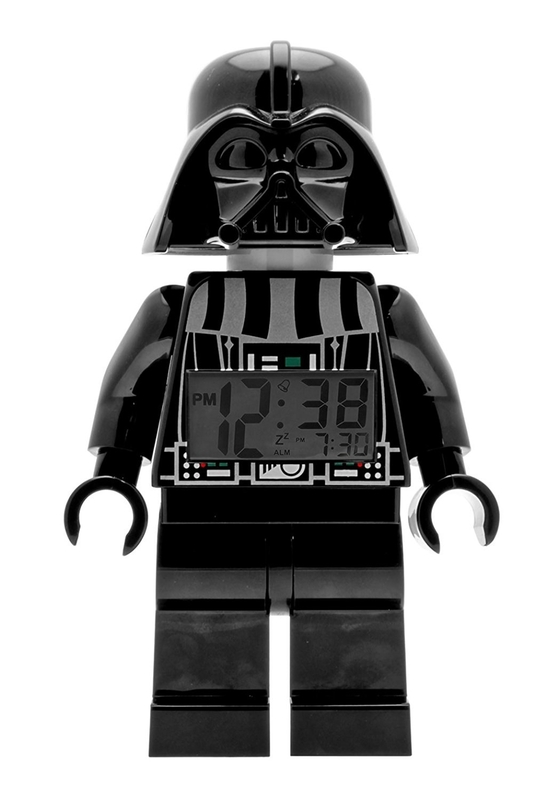 Make mornings less painful with a Lego-shaped digital clock. Pain-free unless you step on it. 19. Enjoy this minimalist clock that will keep chirping until you flip it over. One side says on and one side says off, so there's never any confusion if you set an alarm or not. Get it on Luminaire for $32 (available in five colors). 20. Travel back in time with this super adorable, retro clock. The soft sound of ticking will lull you to sleep. It comes in all the best midcentury colors: anchor gray, bay blue, bluegrass, pale green, and vanilla. Get it on L.L.Bean for $59.95. 21. Let this TARDIS alarm clock guide you back from dreamworld safe and sound. Pop some AAA batteries into this miniature Doctor Who-themed clock (it's bigger on the inside) and get ready for a fun wakeup. The clock makes TARDIS noises and lights up when it's time to get up. It also projects the time onto the wall when you press a button. Get it on Amazon for $22.50 or ThinkGeek for $21.99. 22. Feel like Cupid every morning with a cute heart that wakes you up on time to shoot people with arrows. Even Roman gods of love need their beauty rest. Get it on Pottery Barn Kids for $69. 23. Be fancy and get this electroluminescent clock that's hand-made with actual salvaged Soviet vacuum fluorescent display tubes. Each one of these interesting clocks is hand-made and takes about seven hours to construct, using teak veneer, cedar, and salvaged VFD tubes. It can switch between four LED colors and function on 12h/24h time. Get it on ThinkGeek for $149.99. 24. Feel like Rey using this BB8 alarm clock. Do Jedis ever rely on droids to wake them up in the morning? Probably, and now you can too. This tiny (3.5 inch) digital clock runs on batteries and lights up when you push on its head. Get it on Amazon for $13.59. 25. 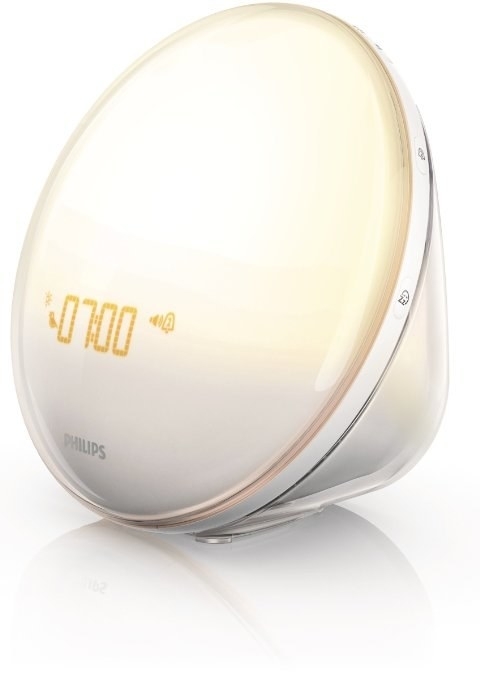 Wake up like a princess with a clock that bathes you in warm light to mimic a sunrise. The handy device also charges your smartphone, provides weather information, plays music, and offers a variety of different colors to fit all your moods. You can control everything from your phone, so everything is easy to set up. Get it on Witti Design for $79.99.